Channeling a fashion forward trend, this belt bag is the perfect day to day accessory. 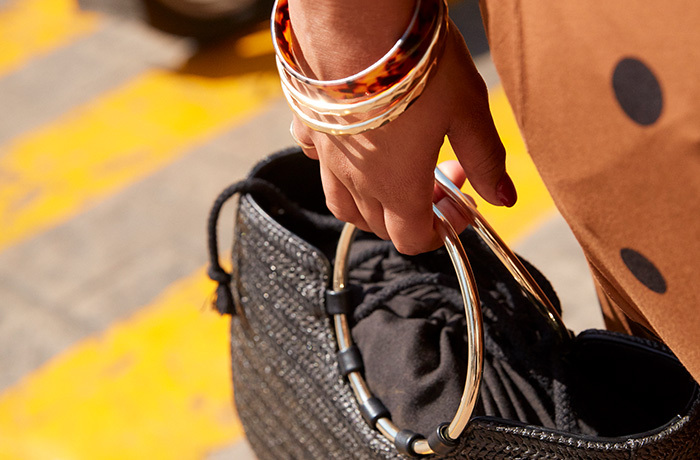 Designed for convertible use, wear it around your waist or over the shoulder. What's your style? This bag is perfect for women who hate carrying a purse on vacation. All be it small it fits my phone, lipstick and my credit cards. After all when your in holiday minimal is best. As far as sunglasses stick them on your head like I do. I plan on buying this for my best friend cause we are off to Italy next. Very cute but too small. This bag is very cute, the red colour is playful. The description however, doesn't provide measurements so I took a chance on ordering it. (It measures 8" X 6" X 1.5") The material looks nice but is very stiff. It's not leather so it will probably not soften over time. For these reasons I couldn't fit a wallet, my glasses, a phone, and a lipstick. The material stiffness is also a problem for the strap handle. The strap of course, was folded in the delivery bag. Upon unfolding it I could see it was not going to straighten out anytime soon. If used as a belt bag that probably won't be a problem. My arthritis won't allow me to wrestle with a handbag so I have to put the cuteness factor aside and look for a more flexible purse. Sadly I had to return it.